Graham Henry took his first steps in the world of coaching whilst teaching at Auckland Grammar School. He then took charge of the Kelston Boys School in 1982 before his appointment as coach of Auckland in 1992. After winning four consecutive NPCs Henry took the reins at the Blues Super 12 franchise in 1996. Success was immediate, with Henry's side taking home back to back titles in 1996 and 1997 before losing in the final of the 1998 competition. After failing to land the All Blacks coaching hot-seat in 1998, Henry became coach of Wales where he turned a struggling side into a competitive unit. 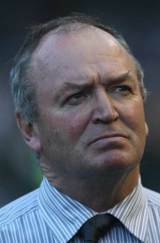 After leading Wales to 11 consecutive wins, and earning himself the nickname of "the great redeemer", Henry became the first foreign coach to supervise a Lions tour in 2001. An unsuccessful tour to Australia followed, with the Lions unable to capitalise after winning the first test. Henry left his post as Wales coach in 2002 after seeing them slip to a record 54-10 defeat by Ireland in the 2003 Six Nations. He returned to New Zealand and further success as the defence coach of the Super 12 winning Blues in 2004, before winning the race to become new All Blacks coach following the departure of John Mitchell. Clive Woodward's England were defeated in Henry's first Test series, but the 2004 Tri Nations ended in disaster as New Zealand propped up the table. 2005 proved to be a far more successful for the Henry regime, as the Lions were swept aside 3-0, the Tri Nations was comprehensively won and in the autumn a Grand Slam of the northern hemisphere sides was completed by a rampant All Blacks squad. Henry was named coach of the year soon after by the IRB, but attracted derision in some quarters due to his commitment to a rotation policy. Henry's job was rumoured to be in danger following the All Blacks quarter final exit at the 2007 World Cup, but he secured a second term after beating Crusaders legend Robbie Deans to the post. The 2008 Tri Nations started poorly for the All Blacks, losing to Australia and South Africa in consecutive tests, putting further strain on Henry and his staff. A rallying performance against Australia and a comprehensive win over South Africa put them back on the road to success before the All Blacks sealed the title with a 28-24 away win over Australia in September 2008. After securing their third Bledisloe Cup success of 2008 with a win over Australia in Hong Kong, Henry's All Blacks recorded a Grand Slam tour of the UK and Ireland in the autumn of 2008, sealing Henry's second with a 32-6 win over England at Twickenham. On the eve of the 2009 Tri-Nations, Henry and his assistant Wayne Smith and Steve Hansen were awarded a further contract up until the 2011 World Cup in New Zealand but the Kiwis lost all three of their subsequent meetings with South Africa in that year's series, as the Springboks romped to the title. However, the All Blacks regrouped quite impressively and reclaimed their crown in stunning fashion in 2010, with Henry guiding his side to an unprecedented six wins from six games. The historic clean sweep was rounded off with a 23-22 victory over the Wallabies in Sydney, which represented a record tenth straight win over Australia for New Zealand. The All Blacks came unstuck against the Wallabies in Hong Kong to snuff out their chance of a record run of Test wins but they responded to the setback in style, sweeping aside the Home Unions in November to claim a third Grand Slam in five years. After masterminding such a magnificent run of results, it hardly came as a surprise when, on December 1, Henry collected a record fourth International Rugby Board Coach of the Year award. Less than a year later he picked up the award again fresh from guiding New Zealand to the World Cup on their own soil with victory over France in the final at Eden Park. Just over a week after the triumph, he announced his decision to step down as head coach and was later knighted for his coaching work.